Editorial Note: Myrna van Pinxteren is a PhD candidate within the Division of Social and Behavioural Sciences. In this reflective article, she shares her experiences of working as an ethnographic researcher with the Movement for Change and Social Justice (MCSJ). Her piece reflects on some of the early successes of the movement and highlights the challenges, opportunities and complexities of collaborating with community advocacy groups in Cape Town. The introductory post on MCSJ can be found here. In the middle of Gugulethu, there is a dentistry clinic that was always overcrowded. People would wait in line from 5am to see the dentist. Due to the shortage of staff in the clinic, the dentist was only able to assist 30 patients a day. Patients would either get up before the crack of dawn to be one of the first 30 people in line, or would have to buy a “ticket” for R30 from people who had queued in order to sell a spot in the line. Queueing in the dark is a major safety concern, particularly for women, and if one came too late, one would have to return the next day. The clinic only offered services 4 days a week, as the dentist had other commitments on Wednesdays. Here, in this book, one of the MCSJ leaders pointed, we have collected the more than 70 stories of people who were waiting in line and would not receive dental care that day. People are waiting in the dark, which is unsafe. We need to do something. When MCSJ heard about this problem, they wanted to investigate the case, as many people had voiced concerns about not being assisted at the dental clinic. Three members of MCSJ went to the clinic and counted and collected testimonies from the 74 people in line (practising something that is known as ‘self-census’). They presented the findings at the facility and motivated for a meeting to discuss the matter with the primary care manager, the dentist in charge, and other staff at the facility. Nodding in understanding, the dentist took the stage with his own evidence in hand. He had brought a monthly targets report, which showed that his dentistry service was performing way above the monthly targets that were set for the clinic. ‘We can only [see] 30 patients a day, as I do not have enough staff in the clinic. That is 10 minutes per patient. And if you compare our performance to the other clinics, we are doing better than all the other ones.’ A closer look at the other clinics in the same district showed that NY3 dentistry was indeed performing much better than other dental clinics, and was even absorbing many patients from other practices. In reviewing targets and resource distribution, the primary care manager only looked at the sum total of all the clinics in the district, not the performance of individual practices. Technically, the NY3 dentistry was performing way above the set target. From a service delivery perspective, there was no need for improvement. From a human rights perspective, however, the data MCSJ collected showed that there was a shortage of services and the community was not receiving adequate health care. This brief case study is the first of many experiences I had being involved in the Movement for Change and Social Justice (MCSJ). This example gives insight into the complexity of health systems – and the role of community participation in health service delivery. South Africa has a fragmented public health system and a high burden of chronic illnesses and infectious diseases, such as HIV/AIDS, TB, diabetes and hypertension . This fragmented health system results in overcrowded hospitals, a shortage of staff and an increasing need for community systems support to fill the gap between health service providers and the needs of patients . The example of dentistry care, part of the wider public health care system, brings many of these challenges to light. Both qualitative and quantitative public health research focuses on strengthening the health system by providing evidence and interventions that aim to improve service delivery, governance, human resources, information and technology . Historically, communities have played a significant role in addressing public health issues by collaborating with researchers, providing a local lens and sharing lived experiences. Nevertheless, the role of the community as an active stakeholder in academic research and health systems strengthening is often overlooked as community members are often reduced to ‘participants’, ‘beneficiaries’ or ‘gatekeepers’, enrolled in studies and randomised controlled trails (RCTs). Since the establishment of MCSJ in collaboration with the Division of Social and Behavioural Sciences (DSBS) in 2016, I have been working closely with the activist group in several campaigns. My PhD research was nested in the larger iALARM project—Using Information to Align Services and Link and Retain Men in the HIV cascade. 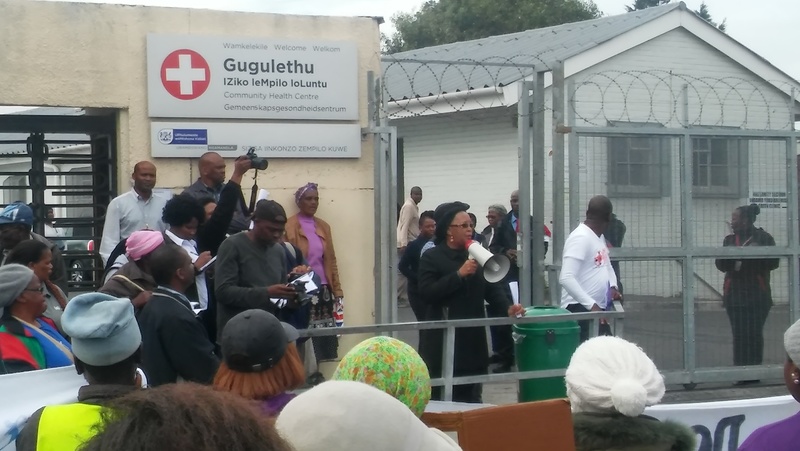 iALARM aims to better link men to HIV services in Gugulethu by improving the collaboration and communication between stakeholders in the health system and community and sharing health information among these actors. As a qualitative researcher within the iALARM project, I was able to both participate and reflect on the partnership between MCSJ and UCT for the last two years. MCSJ often asked me to take notes during community meetings, assist with developing pamphlets for campaigns or help with organising workshops. During this time, I learned so much about the Gugulethu community and met a number of my key informants with whom I created long-lasting relationships. Being a member of MCSJ showed me how the overarching structural deficits of the health system, combined with broader socio-political factors, affect the health system at large. By being so closely linked to MCSJ, I was also able to observe and unpack the growing partnerships between community members and health system actors, which are vital to health systems strengthening. Maintaining and creating positive relationships between the community and health systems actors can be difficult and time-consuming, but has been the key to most of the successful MCSJ campaigns. By closely following MCSJ as they took steps in planning and campaigning, I had a unique opportunity to observe community activists, learn about their history, passion and commitment, and better understand the ‘modus operandi’ of this vibrant community organisation. In South Africa, there are other successful community engagement projects that make a meaningful contribution to local communities by conducting participatory (action) research. The focus on engaged scholarship that is pursued by universities further highlights the need for rethinking how academic research is conducted in communities and to critically asses how relationships with community stakeholders are negotiated . The dentistry case was one of many milestones that MCSJ has achieved over the past two years. It is a snapshot which highlights how community organisations can successfully improve service delivery and hold the health system accountable. In various other campaigns, DSBS has played a vital role in disseminating and co-creating knowledge with MCSJ by actively participating in community events and by organising skills-building workshops. As a UCT-based researcher, I hope that the fruitful collaboration between DSBS and MCSJ inspires the development of adaptive and responsible future community engagement projects within the Division and beyond. Reflecting on my own role in MCSJ, I want to highlight the opportunities of intersecting community activism with academic research and show that engagement with an organisation such as MCSJ is a unique chance for students and researchers to collaborate with community activists at a local level. It is important to create meaningful relationships that go beyond just participating in research. Often, researchers are rightfully accused of extracting information from the community for their own papers or theses without sharing the research results with communities. How can researchers spend weeks, months or even years in a community, creating networks and building trust to collect data that will be published in national or international journals and add to scientific knowledge, but forget to disseminate the outcomes to a broader public? I believe this is partly due to the lack of guidelines and consideration of critical questions when developing research projects. Ethical issues such as knowledge dissemination and negotiating community relationships should be addressed when writing a protocol and should be thought about carefully at all stages of the research, not just as an afterthought or a ‘nice to have’. Knowledge should be co-created and it is the responsibility of the university, ethics boards and funders to treat these vital components of research as mandatory, not optional. Community engagement via “social responsiveness” is already a core component of the UCT ethos; now is the time to rethink how to do this meaningfully. 1. Mayosi, B.M., et al., Health in South Africa: changes and challenges since 2009. Lancet, 2012. 380(9858): p. 2029-43. 2. Chopra, M., et al., Achieving the health Millennium Development Goals for South Africa: challenges and priorities. The Lancet, 2009. 374(9694): p. 1023-1031. 3. Gilson, L., et al., Building the field of health policy and systems research: social science matters. PLoS Med, 2011. 8. 4. Cooper, D., T e UCT idea of ‘social responsiveness’:‘Engaged scholarship’must be at its conceptual core for academic staff. University of Cape Town (UCT), Social Responsiveness Report 2010, 2010: p. 26-37. Myrna van Pinxteren holds a MSc in Social Anthropology and is a PhD candidate in the Division. As a qualified journalist and anthropologist, Myrna's research interests are focused around the use of communication and information to strengthen health care and the practical use of medical anthropology in everyday life.